Our cover story this week is our first review of the 2019 Honda CRF250RX, the Red Company’s all-new 250cc off-roader. We also have an interview with flat track racer Dalton Gauthier, who after a near two-year suspension due to substance abuse, returned to racing and picked up right where he left off–winning. He says he’s clean now, has learned from his mistakes and has far-reaching goals. It’s an interesting read. There is plenty of racing to get caught up on, and we have it all: Nashville Supercross, Aragon WorldSBK, Road Atlanta MotoAmerica, Cherry Creek Hare & Hound, MXGP of Trentino, Tennessee Full Gas Sprint Enduro, FIM SuperEnduro, Michigan ISDE Qualifer, Las Vegas NHRA, and more. Want to know who did what? 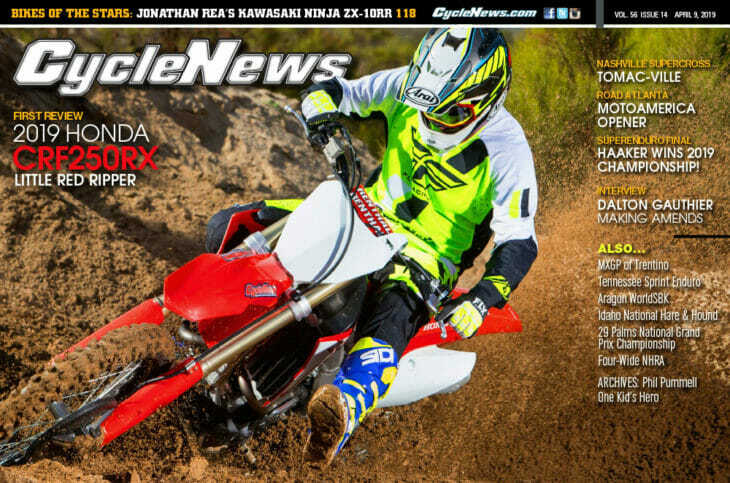 Check out this issue of Cycle News magazine. It’s all right here and it’s all free.